Forecast Products . . .
Meteorology Links . . . 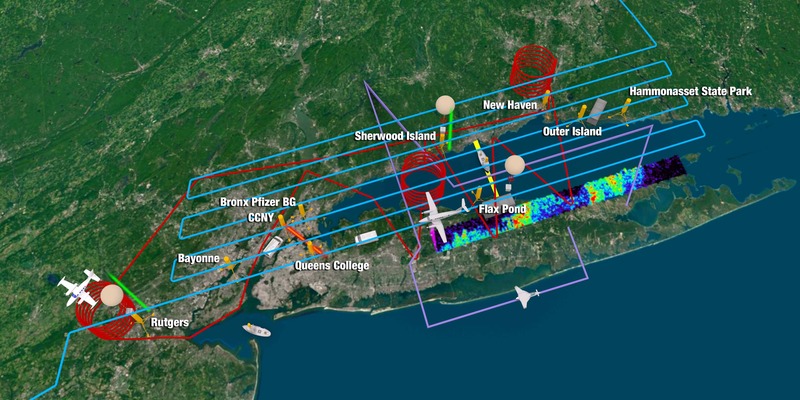 The Long Island Sound Tropospheric Ozone Study (LISTOS) is a multi-agency collaborative study focusing on Long Island Sound and the surrounding coastlines that continue to suffer from poor air quality exacerbated by land/water circulations. The primary measurement operations are planned between June-September 2018 and include, but not limited to, in situ and remotely sensing instrumentation integrated aboard three aircrafts, a network of ground sites, mobile vehicle and boat measurements. The goal of this study is to improve the understanding of ozone chemistry and transport from New York City and upwind regions to downwind areas, particularly over Long Island Sound. Despite air quality improvements nationwide, the population in this region still suffers from high ozone concentrations year-to-year. 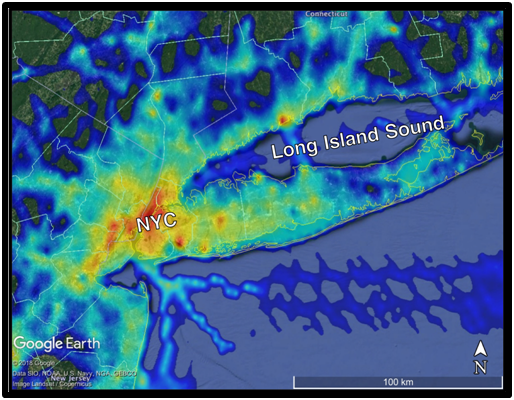 The science team plans to work toward assessing emissions inventories over the region, as well as investigating the complicated chemistry and dynamic patterns associated with Long Island Sound and its coastlines influenced by sea breeze transported pollution. NEI 2011 NOx emissions projected to 2018 over the LISTOS study region. When under the influence of west-southwesterly flow and sunny skies, ozone precursors (NOx and VOCs) from NYC and other upwind regions are transported over Long Island Sound where ozone is rapidly produced and then advected inland over coastal Connecticut, and potentially Rhode Island and populations further downwind. This study extends on previous missions with similar research goals of increased understanding of poor air quality along coastlines influenced land/sea breeze interactions, including: DISCOVER-AQ over Chesapeake Bay (2011) and Gulf of Mexico/Galveston Bay (2013), LMOS in Western Lake Michigan (2017), and OWLETS over the lower (2017) and upper (2018) Chesapeake Bay. This study also gives NASA the opportunity to test air quality remote sensing retrievals with the use of its airborne simulators (GCAS/GeoTASO) for the preparation of TEMPO observations for monitoring air quality from space, as well as help collaborators in the validation of TROPOMI science products with the use of airborne- and ground-based measurements of ozone, NO2, and HCHO during LISTOS. This study would not be possible without the large number of participating institutions and agencies, including: NASA, EPA, NOAA, NESCAUM, local state agencies, and numerous other research institutions and air quality management agencies.